The waterfall modeling tool allows you to model exit scenarios for your company and understand the economic impact on share classes and top stakeholders. Exit value: This input is for the exit value you want to run through the waterfall model. Non-convertible debt: This input allows you to add any debt the company has that is not already captured on the capitalization table. This may include loans and other types of liabilities. Exit date: The exit date is used to decide the 'as of' date of the capitalization table. If the company has interest or dividends, they will continue to accrue value until the selected exit date. 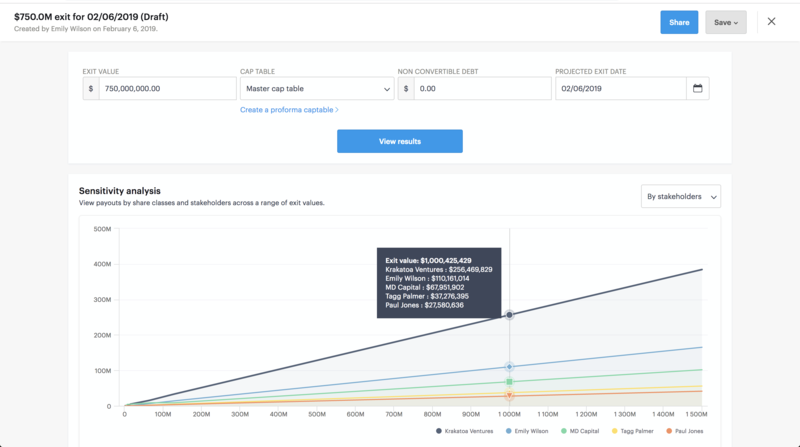 Selected cap table: For users that have created cap tables through the financing round modeling tool or pro-forma valuations tool on Carta, you are able to switch the cap tables used in the scenario to any of the created cap tables. Sensitivity analysis: The distributions chart allows you to see a range of outcomes top 5 shareholders and share classes. Payouts: Shows you the payouts for the exit scenario for by share class and top 30 stakeholders. Once you have created a waterfall model, you are able to save and share with other members of your team. 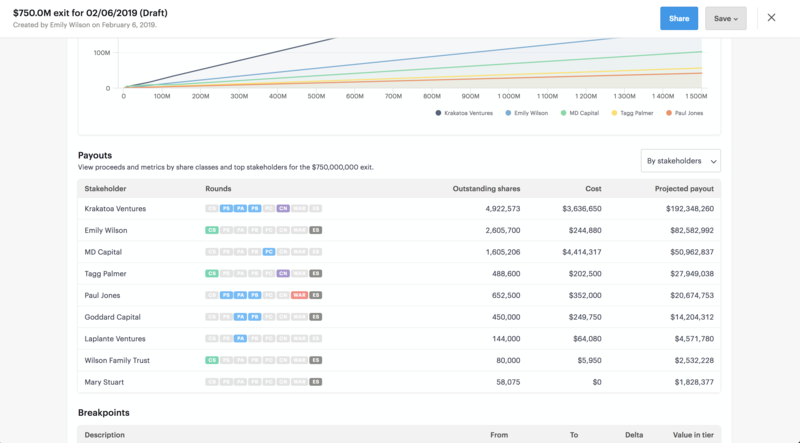 The waterfall feature uses the same breakpoint calculations that power our industry leading valuation software to calculate the payouts of your company based on your cap table data and modeled exit value. Convertible notes: Convertible debt, equity, and SAFEs will accrue any interest they are entitled to up until to selected exit date, and depending on their rights and preferences, will convert to common stock based on the modeled exit value and their valuation cap. Options and equity awards: All issued equity awards will respect the selected exit date to calculate how many of the awards are vested as of modeled exit.